Martha McDonald: Music for Modernist Shapes: Reimagining Spectodrama - Marginal Utility, Inc. Seating is very limited. Reservations required. Marginal Utility is proud to present Music for Modernist Shapes: Reimagining Spectodrama, a solo exhibition of recent work by the Philadelphia based artist Martha McDonald. Music for Modernist Shapes: Reimagining Spectodrama is an installation and performance by Martha McDonald inspired by Bauhaus alum Xanti Schawinsky’s 1936 theater piece made with students at Black Mountain College. The installation features video, folded paper sculptures and costumes, and other objects inspired by Schawinsky’s historic piece. 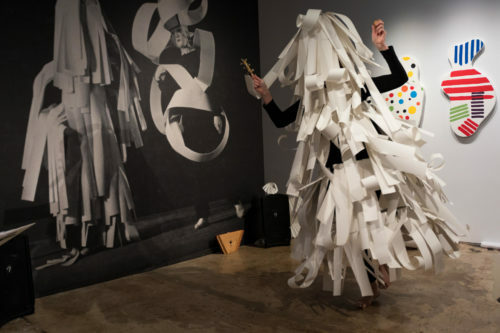 The original performance included folded paper costumes, light projections and live music. McDonald and composer/multi-instrumentalist Laura Baird will activate McDonald’s installation of objects and costumes in a reimagined staging of Schawinsky’s Spectodrama, conjuring the memory of this little-known work from the experimental college’s rich performance history. Music for Modernist Shapes features an original score by Baird, which draws on archival scores from Schawinsky’s performance collaborations with Black Mountain College music teacher John Evarts, avant garde music from 1936 and Appalachian folk songs from the Black Mountain region. The project was commissioned by Black Mountain College Museum + Arts Center as part of ACTIVE ARCHIVE: Martha McDonald (2017).